Published on March 30, 2013. Our most recent work got accepted to ICWSM 2013! See the publications page for the full paper. In this study, we develop methods to identify verbal expressions in social media streams that refer to real-world activities. Using aggregate daily patterns of Foursquare checkins, our methods extract similar patterns from Twitter, extending the amount of available content while preserving high relevance. We devise and test several methods to extract such content, using time-series and semantic similarity. Evaluating on key activity categories available from Foursquare (coffee, food, shopping and nightlife), we show that our extraction methods are able to capture equivalent patterns in Twitter. By examining rudimentary categories of activity such as nightlife, food or shopping we peek at the fundamental rhythm of human behavior and observe when it is disrupted. 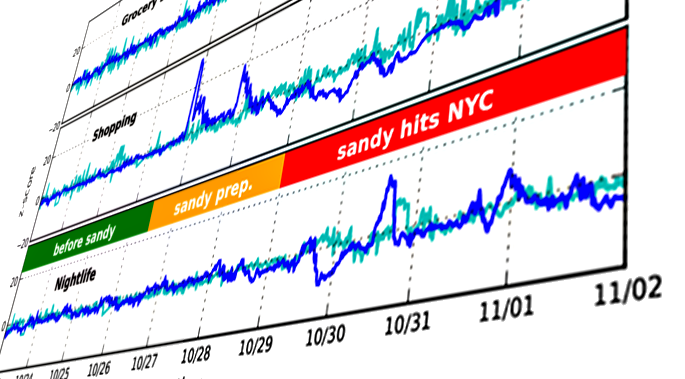 We use data compiled during the abnormal conditions in New York City throughout Hurricane Sandy to examine the outcome of our methods. When Do People Expect More Likes and Comments on Facebook and From Whom? Our recent work got accepted to CHI 2016! See the publications page for the full paper. I think this work is interesting for three main reasons: the questions we addressed, the methodology for answering them, and the answers we arrived at. It was a great attending WSDM this year, right at the heart of NYC! I could not possibly cover all that went down there in the three days of the conference, but would use this post to highlight sessions and talks that I attended and found particularly interesting. Our Semantic Keyword Expansion API is ON!